130 years is a long time. In the last 130 years there have been two world wars, 23 US Presidents, 11 states admitted to the USA, and the creation of The United Methodist Church. Throughout those 130 years of change, transition, and, at times, calamitous upheaval there has been one constant: the grace and presence of God as expressed through the people of Blakemore Church. Since its founding in August of 1890, Blakemore has stood as a witness to the incoming Kingdom of God for the last 130 years and, by God’s grace, we will be bearing witness for One Hundred Thirty More. One Hundred Thirty More is focused on the above-mentioned building needs; those needs are a means to an end. The conversations and ministry that this space allows to occur is our passion. God’s grace and faithfulness is not theoretical. It is flesh and blood. It is a safe and warm place to rest as we share a meal and host our neighbors who experience homelessness each winter. It is the parenting advice and stories exchanged across the table at Wednesday Night Life. It is the community of those who share their burdens through the Depression Support Group and find hope, healing, and health. It is in the sack lunches and clothing given away to the hungry and those in need. It is the hands of those sharing communion each Sunday at the corner of West End and Bowling Avenues, so that those hands might minister to the needs and hurting of the world. Enclosed is a flyer providing an overview of One Hundred Thirty More and a pledge card. 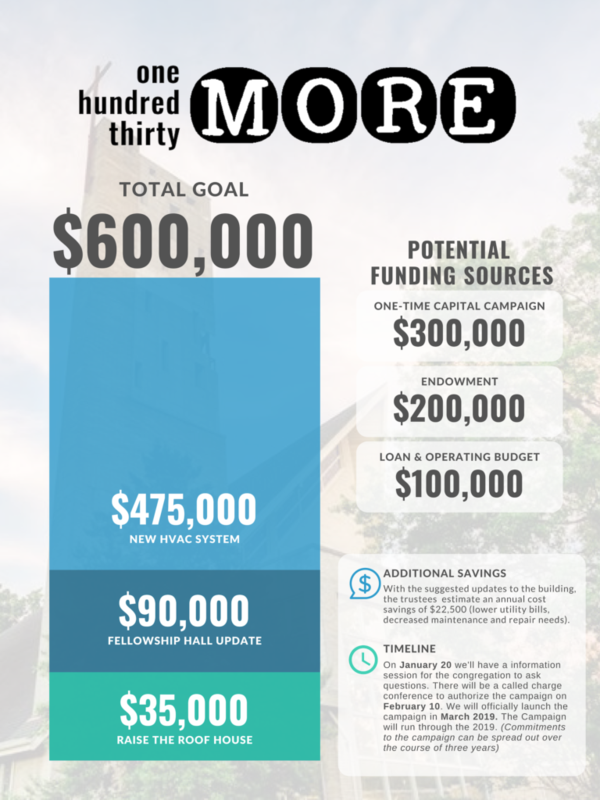 We ask that you prayerfully consider the level of financial commitment you can make to this campaign and return the card by April 21. To donate, please mail in checks or visit our website. No donation is too large or too small. We invite you to join us in celebrating God’s faithfulness for the last 130 years and partnering with us in anticipation of One Hundred Thirty More! To make an online donation, please use this link.